Doctor Who: THE ULTIMATE ADVENTURE | Warped Factor - Words in the Key of Geek. We know for a fact that several past Doctors & their companions (and indeed the present incumbents of the TARDIS) have trodden the boards down the years. But what you may not know unless you're an obsessive fan of either the Third or Sixth Doctor is that both have a degree of theatrical experience! 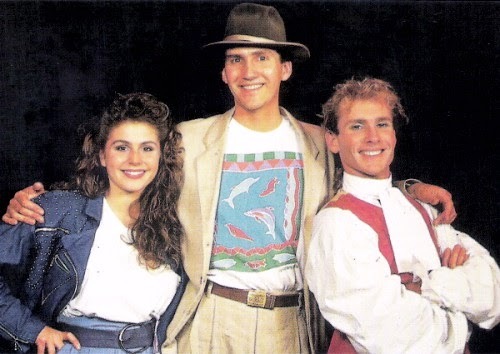 Wait with us behind the curtain as we look back at The Ultimate Adventure, Terrance Dicks' first and perhaps only attempt at a musical. Yes, you read that right! And amongst the song & dance there were Daleks & Cybermen, as they formed an alliance to kidnap the intended American representative at an Earth-based peace conference in a sort of rehash of the basic plot of Day Of The Daleks. Who knew the dictatorial dustbins and men from Mondas respectively could hold a tune? Well, actually audiences would have been a bit disappointed in that regard as they don't actually get to show off their singing chops- more's the pity! The man in the dandy jacket and opera cape has done so before of course, while taking a shower after tumbling from the TARDIS in Spearhead From Space. "Broadly speaking Terrance Dicks' story was pitched for a younger audience than the majority of television stories however it remained true to the spirit of Doctor Who that its plot could be followed easily by children, while the dialogue sustained enough jokes for the older members of the audience. The narrative took the ambitious form of a string of set-pieces with special effects and multiple locations that were realised with varying degrees of detail. There were three key elements that contributed to the lure of this production: Firstly the lead was an actor who had actually played the Doctor on television, something that had never happened before. 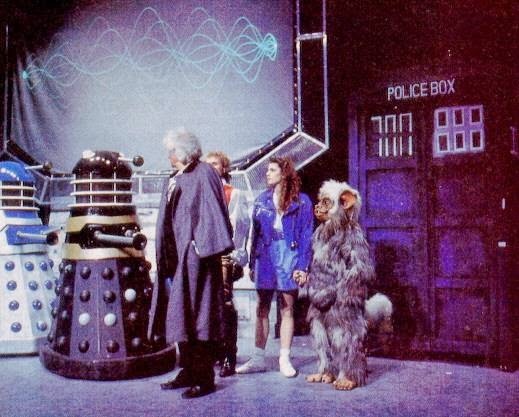 Secondly it featured both the Daleks and the Cybermen, which was something of a fan's dream. Thirdly the production employed lasers and a large computer screen to great visual effect giving the play a technological edge and a portrayal of futuristic weapons and force-fields that was superior to most of the television series." Quite the spectacle then, back in the day! "With the help of the mercenary Karl, the Daleks and Cybermen have entered into an alliance to use the Doctor as a pawn in the destruction of Earth. The Doctor and his companion Jason are summoned to Earth by the British PM, who needs the Doctor to prevent a kidnap attempt against the US envoy to a forthcoming peace conference. The Doctor and Jason thus travel to the nightclub Number Ten, but are too late to prevent Karl and his men from kidnapping the diplomat. A nightclub singer named Crystal inadvertently accompanies the Doctor and Jason into the TARDIS as they follow the trail of the mercenaries to Altair Three, where they barely escape an attack by Cybermen. They next follow a clue to the Bar Galactica, run by Madame Delilah, but Karl and the mercenaries are waiting, and they are forced to flee along with the alien Zog. The Daleks then capture a TARDIS and transport it to their mothership, but the Doctor outwits them and tries to take himself and his companions to safety. They end up on a seemingly barren planet which reacts adversely when Crystal starts singing, and subsequently travel to 18th-century France, where they narrowly avoid being beheaded. The Daleks have sabotaged the TARDIS, but the Doctor fixes the problem and returns to the Bar Galactica, where the Daleks turn on the mercenaries, killing most of them. Karl thus helps the Doctor to locate the Dalek ship, where the Doctor rescues the US Envoy and tricks the Daleks into revealing that they intend to dispose of the Cybermen once their plans have succeeded. 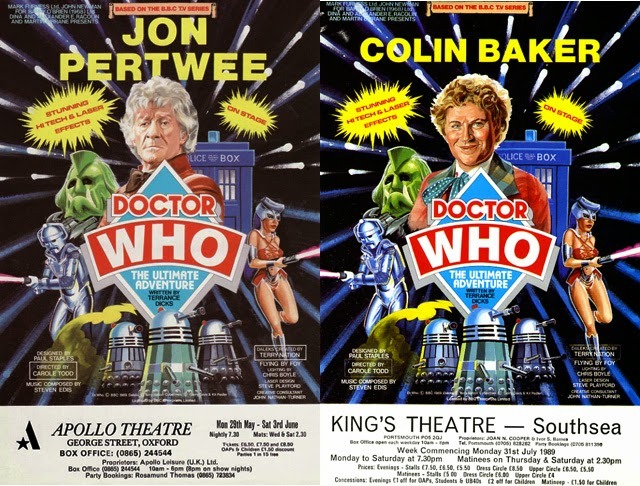 When Jon Pertwee handed the keys to the stage-TARDIS to Colin Baker the play was adjusted accordingly to conform with the Sixth Doctor's persona. Banks was part of the ensemble cast, usually playing the role of Karl the Mercenary, but many Who fans will know him better as the Cyber Leader in all the 1980s Cybermen stories - Earthshock, The Five Doctors, Attack of the Cybermen and Silver Nemesis. 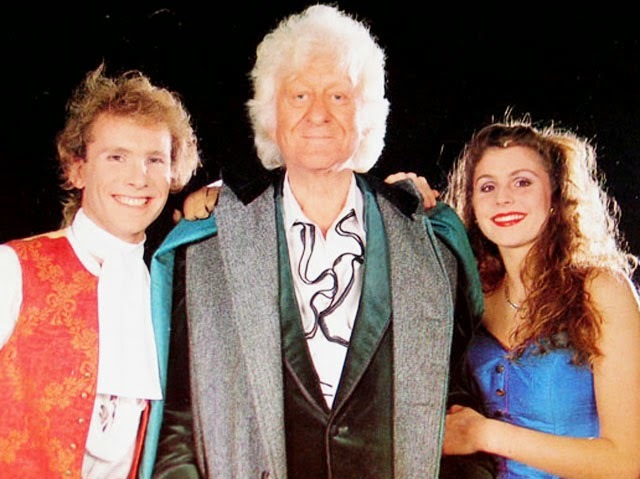 Then, from June 5th, it was time for Colin Baker to step in! Big Finish made an audio adaptation in 2008, Colin Baker returning in the same campy spirit of the original stage performances! They then followed it up in 2011 with a sequel, ingeniously titled Beyond The Ultimate Adventure. 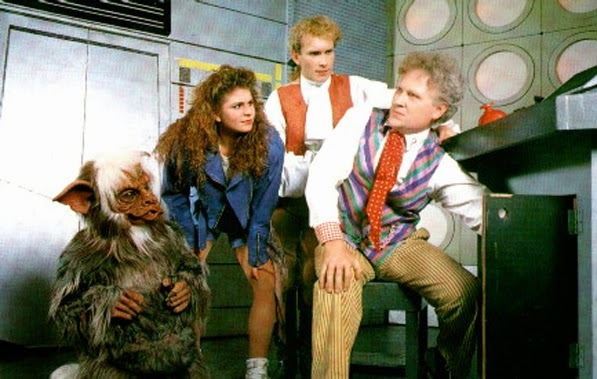 As for Colin Baker himself, The Ultimate Adventure wasn't even his first brush with a good warble. The ending of Terror Of The Vervoids reveals that the man in the technicolour dreamcoat has taken to a good singsong, though Mel isn't too pleased with his vocal efforts! DOCTOR: She means that, too. Memory like an elephant. MEL: That's his idea of a compliment, comparing me to an elephant. DOCTOR: But so ludicrously appropriate, I find it amusing. MEL: Well, at least if you're laughing you can't be singing. Have you ever heard his rendering of On With The Motley? Count your blessings.